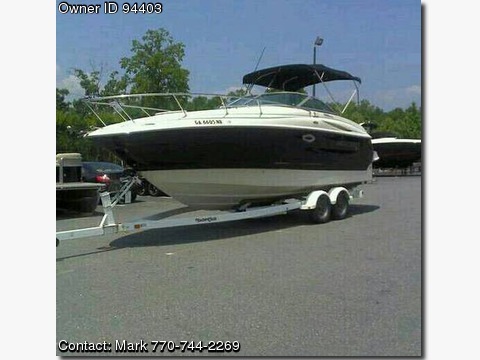 Call Boat Owner Mark 770-744-2269 770-540-4374. I'm selling my 2004 Monterey 245 cr. Total length with swim platform is 27ft. It has only 450 hrs 5.0 Volvo Penta motor. Comes with dual axel w/ brakes Yacht Club trailer. Very clean boat an well taken care of. Some of the options are microwave, refidgerator, carpet inside and outside. GPS, Plow steel anchor, full canvas camper enclosure, vacuum head with shower. New alpine marine speakers inside an out new cd player installed multiple mp 3 jacks through out the boat for easy access. New 20in HD TV an dvd player. New 20% window tint an new teak Seadek on swim platform. I have also installed blue led's inside an outside as well.Too many options to list you must see in person. Selling the boat because I bought a bigger boat so my loss your gain. Private sale so no taxes. Please contact me at 770-744-2269 thanks.